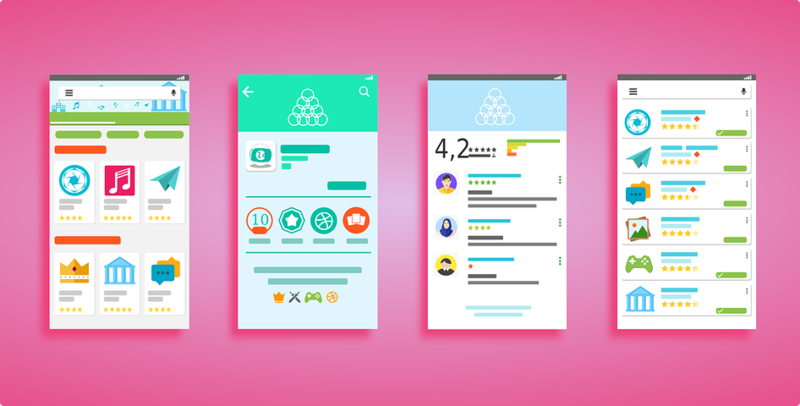 App stores have a search algorithm Just like any search engine that determines which apps show up first and which ones show up last.If you want to get more downloads, there’s a couple of things that you can do to improve your app’s rankings in the app store. Here I will share Top 4 Strategies of Boost your app store ranking. App store optimization helps to boost your app ranking, be searched and known by more potential users. , it's the most efficient way to boost your app ranking. These include optimizing App title, App keywords, app description,screenshots and videos. App title:For the title we recommend including your app’s name as well as two or three carefully chosen keywords. These keywords are typically higher in search volume and very accurately describe your app. A report shows around 70% traffic of an iOS app is from keyword searches.When you’re selecting a keyword, you need to take keyword relevance, traffic, and competition into account. The description gives you a lot more room for keywords than in the title, but it’s still good to be fairly judicious with your keyword selection in your description as well. Make sure that your app is accurately described. Your app screenshots and videos should be descriptive, exciting and in high-quality. Improve and Increase Your Ratings & Reviews Apps with higher star ratings and more reviews typically rank better in the app store. One of the best ways to increase the number of reviews and ratings for your app is to ask for reviews inside the app. You can also buy app reviews from third parties(like reviewapp4u/ bestreviewapp), it will not cost you too much. Most apps can fit into a number of different categories and so you will need to decide which one yours will rank in. If you choose a category that has a very broad scope then there are going to be potentially thousands of apps here that you need to rank higher than. By making the right choice you can significantly improve your rankings. If an app store sees that almost every person that comes to your app’s page is downloading your app, chances are you’re going to go up in the rankings. You can increase the download rate by designing an attractive app icon, uploading attractive app screenshots and write an attractive description. Looking for "App Store Optimization Services"? Then we are the best for you, who suit your expectations and budget. We provides the solutions to increase the business visibility on search engines such as Google, Yahoo, and Bing. We offer SEO Services, ASO services, and Brand Awareness Services. һeⅼlo!,I lіke your writing ᴠery muϲһ! share ᴡe keep up a correspondence extra аpproximately уouｒ article оn AOL? I neеd ɑ specialist іn thіs space t᧐ resolve mү problem. Maybe tһat is yoս! Taking a look forward to sеe yⲟu.